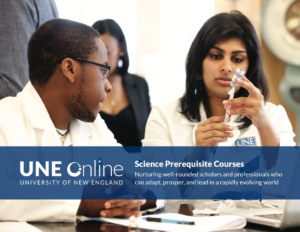 This online course is four semester hours and includes a virtual laboratory component. This lecture and lab course is designed for individuals who need a semester of biology as a prerequisite to apply for admission to a program in the health profession. The overall goal of this online course is to provide the student interested in the health professions with an introduction to biology that emphasizes the concepts that will be important for, and provide the basis for, the topics the student will encounter in their professional studies. Topics considered include biochemistry, molecular biology, cell biology, pharmacology, and physiology. To achieve this goal, this human biology course emphasizes a conceptual approach to the principles of biology. The student is encouraged to learn factual material within a conceptual framework in order to achieve an understanding of basic biological theory. By doing so, they will be able to apply this material to their further studies. Numerous examples, largely relating to human biology and especially to human health and disease, are provided to encourage this process. The Online Medical Biology I course content considers cell structure and function, metabolism, mitosis and meiosis, inheritance patterns and molecular biology. Click here to see the syllabus. The text for this course is an ebook with homework assignments as part of your purchase. You can buy access to these at the UNE bookstore or after you have enrolled in the course, you can buy it directly from the publisher by clicking on the first homework link. If you purchase it from the bookstore, it will ask for a course website. Simply go to the blackboard site and click on the first homework link. You can then enter your access code there. Note: for students planning to enroll in Medical Biology II following this course, the same book and homework system will be used. The access that you purchase for Medical Biology I will last for one calendar year so that if you complete both courses within this time frame, you will NOT need to purchase any additional text materials for Medical Biology II. You will be able to use the same code that you used in Medical Biology I for the text. The cost of the laboratory materials is not included in the laboratory fee and must be purchased by the student directly from the supplier, Hands on Labs (HOL). The lab pack includes access to the online HOL website and the supplies needed to perform the experiments that will accompany this course. You may need to supply other basic items such as paper towels, scissors, a pen, etc. but these will all be listed in the laboratory information from HOL. You should plan on ordering your lab kit once you have registered for the course. For the best experience, check the system requirements from the publisher. Please note, some activities in this course use Flash, and are therefore not screen-reader accessible, and may not work on a mobile device. If the browser you’re using no longer supports Flash, try a different browser and download the Flash plug-in for this content. It is mandatory for students enrolled in the course to order a lab kit. The kit must be purchased directly through Hands-on Labs and cannot be purchased second hand or from another vendor. Students must complete both parts of every lab – the assigned experiment and the corresponding assignment online – to earn a grade for the lab. Note: Kits can take 5–7 business days to arrive. Once you receive the kit, please use these directions for registration . There are no prerequisites for this distance course, Online Medical Biology I.